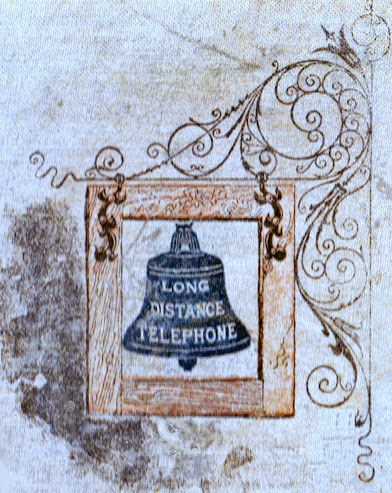 The 1889 Bell was the earliest logo used. It was available in a flange or as a a square that hung from a bracket. Brackets of the time were quite ornate, but probably not as fancy as the one above, which came from the cover of an 1893 date book. The first Bell System sign was introduced in 1889. Because there was no enamel sign production in the United States at the time, it was manufactured in England. The example above had been repainted with sparkly blue paint and listed on eBay with a $150 Buy-it-Now. An interesting feature of this sign is that the LD logo was stamped into the steel. This would seem to indicate that the enamel was painted on by hand. Later signs were screen printed. Around 1895 "LOCAL AND" was added to the logo. 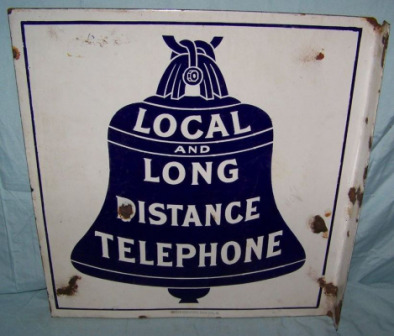 These appear in a great number of types, with New England Telephone & Telegraph and Southern Bell Telephone being the most common local operating companies. Here is an extremely rare etched glass sign from N.E.T.&T. Co. in it's original frame. 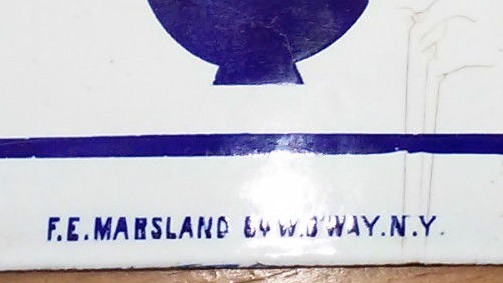 An example advertising a "Public Station"
Once companies such as Ingram & Richards, established themselves in the United States in the 1890s, production of porcelain signs took off. Ingram & Richards was not the only company to manufacture porcelain signs, as this example from the Baltimore Enamel & Novelty Co."BALTO. EML. & NOY. CO." shows. Balto was another major sign producer. Here is an example from the Burdick Sign Company (B.S.Co. 52 State Street Chgo and Harvey ILL) of Chicago. Another example from Samuel Buckley & Co., another English manufacturer. Here is another generic sign, this one with a blue border. Note the "block" style lettering ($400). 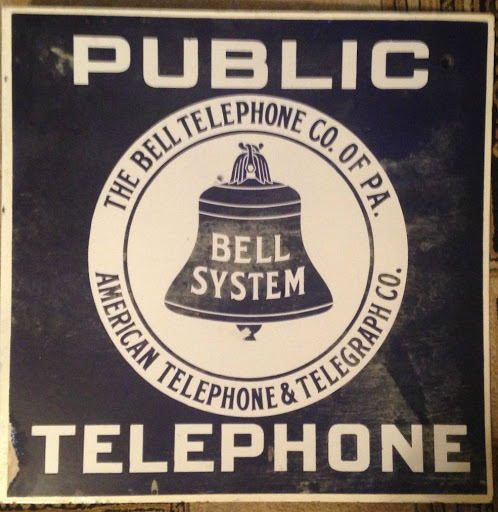 Bell Telephone Co of Philadelphia was organized in 1908, and Bell System began being used on signs in 1909. This dates the sign to around 1908-09. Note the fancy lettering. These Pay Station flanges are fairly common and are often faked. Note the unusual maker's mark. Unusual Pay Station booth sign, these are usually found with blue backgrounds. The American Bell Telephone Company was re-organized and became a subsidiary of the American Telephone & Telegraph Company in 1908. 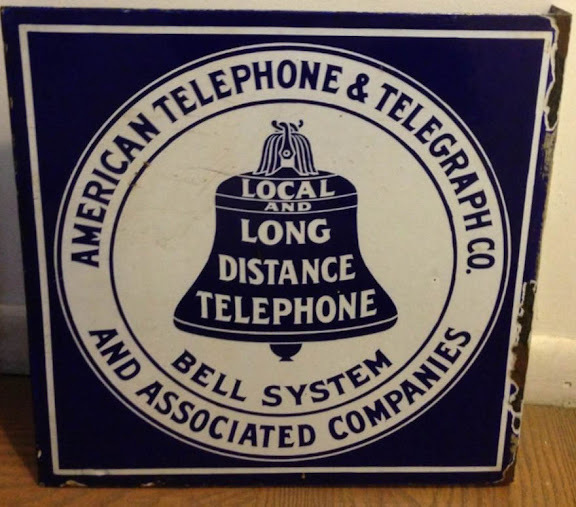 Around that time "Bell System" was added and American Telephone and Telegraph Co. and Associated Companies" appeared in a circle around the bell. Most had a white border along the outer edge. It is much less common to see signs that do not have the border. Interestingly, although many N.E.T.&T. signs feature the A.T.&T. logo, many of the subsidiatries feature the N.E.T.&T. logo. Another example using the AT&T logo, with the Southern Bell name below. Three variations of a sign with the Southern Bell logo, note the absence of "Bell System" and AT&T. Is this even an 08' bell or is it earlier? Pacific Telephone Pay Station sign in white (court. Fabius) by BALTO. BEWARE OF FAKES The fake version measures 12"x16" while the real version is 16"x20". Also the blue border on the real version touches the edge of the sign. A Telephone Company of Nevada sign. Nevada was a subsidiary of PTT, note the similarities to it's parent company's sign above. Signs from this telco are extremely rare. A true 1908 Version (says "Bell System"). My version was made by the Lafayette Steel & Enamel Co. 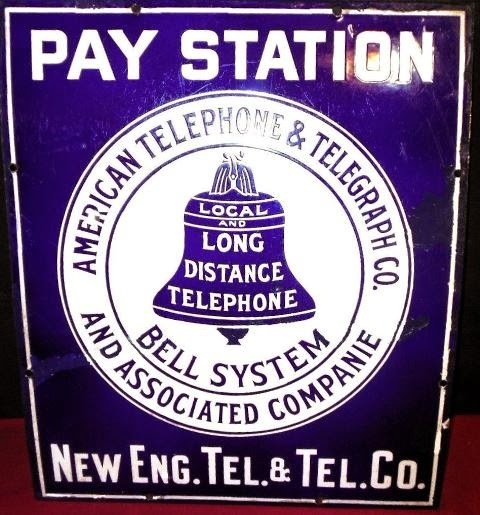 Note that it says "Public Pay Station"
FAKE ALERT reproductions of the sign above were sold through PHONECO and are frequently sold on eBay as the real thing, they are almost always fake. Look for perfect blue paint on the flange, a dead giveaway! Many early signs cannot be easily categorized, as the "Bell System" was a much more diverse entity in the early years as the variety of types from that era shows. While not technically an '08 Bell this rare sign from Mutual most closely resembles the '08 pattern. The picture above is Photoshopped from two sides of the same sign. The original is badly corroded. 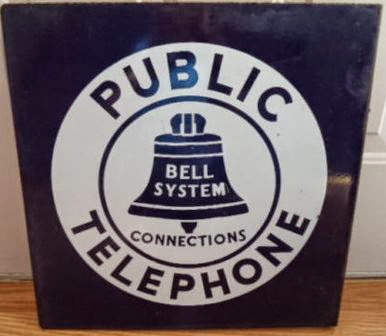 This logo was used by the Bell Telephone Company of Canada after the Bell System had adopted the "1921 Bell. One of the rarest (and most sought after) of the 11" flanges is from the Bell Telephone Company of Nevada (court. Signguy) The lettering on this sign is thinner than the typical sign of this type. This is possibly an indication that a different manufacturer was used other than the ING-RICH or BALTO. The same style of lettering can be found on some signs from PTT, Nevada's parent company. There were a wide variety of signs that used the 21 Bell, from several different operating companies as well as AT&T. "Incorporated" on a 21' pattern sign indicates that the sign is later. "Connections" on a sign meant that the company was able to connect to the Bell System, although the telco was not owned by AT&T. Bell Telephone Co. of Pennsylvania "lollipop" sign. This would have been mounted on a stand. These large signs were used by a few telcos and are very rare. Smaller reproductions of this sign turn up on eBay frequently. This type of sign was used by a number of telcos. 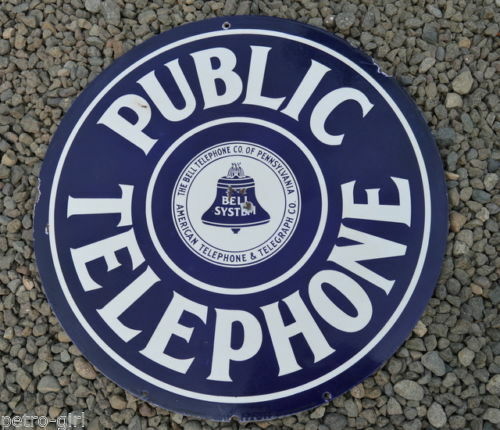 New England Telephone ($125) versions of this sign are the most common versions. 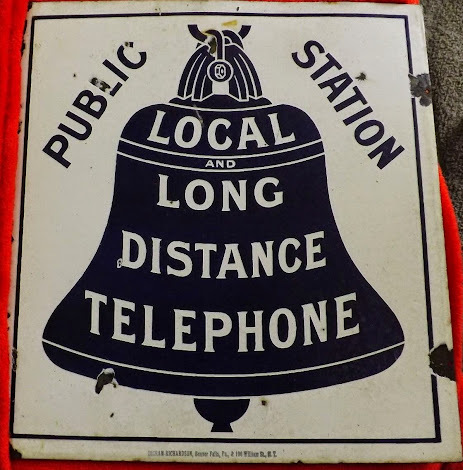 In 1931 the first steps were taken to produce a universal sign that could be used throughout the Bell System, an idea which would be adopted on a larger scale with the 1939 re-design. The Northwestern Telephone Company designed the signs and used them in it's territories. The 1921 Bell continued to be used in the rest of the Bell System until the introduction of the '39 Bell. There is evidence that some of these signs may have been used outside Northwestern's region, but the extent is unknown. These are more often seen as flanged signs like the one above. It is possible they were used beyond Northwestern territory. 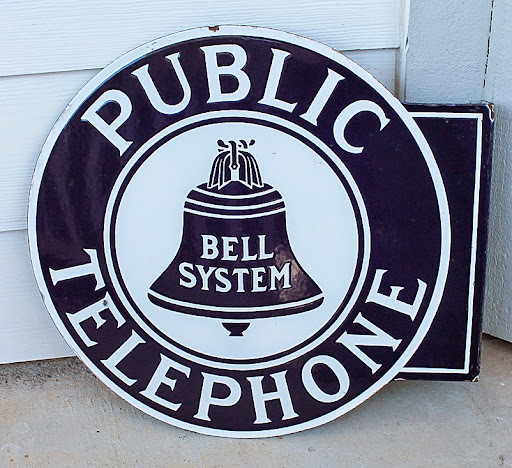 The 1939 re-design saw a more stylized bell that eliminated the the name of the local operating company and AT&T and just used the term "Bell System". These are available in 11' and 16" flanges. A recent discovery of an 16" version with "24" stenciled on the flange suggests that the 11' was a #23 and the 16" was designated #24. For #21 and #22 see hubcaps below. The 20" Booth sign is #26. A slightly different version used by independents that connected to the Bell System. The back side of these are usually white with the model # stamped on the back, although sometimes they are dark blue. 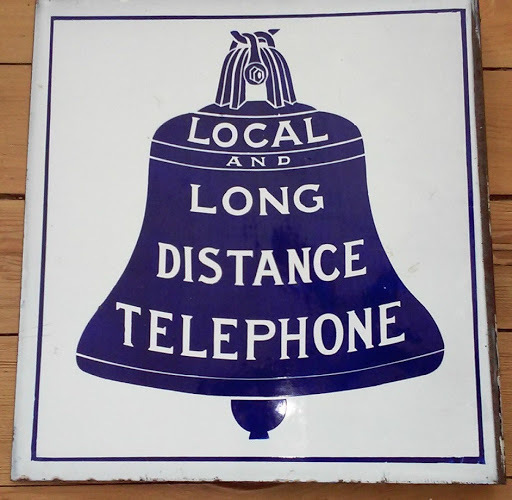 The "Connections" version of the sign was used when a smaller telco had an arrangement with the Bell System for long distance service. These signs were marked with a "C"
Signs that are 9" across, have olive green or dark gray backs, or are not stamped are reproductions. 1969 saw the use a highly stylized bell that marked the end of an era. Signs were no longer porcelain, they were now generally made of plastic or painted aluminum.